Yet another .35cal for the year (.358 Winchester)! This appears to be a .358cal year for me. If I'm not getting them.........I'm shooting them. Well, this cartridge has been a long time coming for me. I bounced back and forth about how I wanted to go about acquiring/building the platform for this cartridge. I'd considered a bolt gun, but already have a bolt action rifle in .35 Whelen. So, I didn't want to mimic that rifle or I might as well use that one. I wanted something different. Then, a certain someone conned me out of my Marlin 1894 in .44 Mag using their puppy dog eyes and Jedi Mind Trick. While boxing the rifle up, I realized how handy it was. Compact and svelt, it shouldered well, pointed quickly...............BINGO! Measuring the 1894's OAL........I figured out what barrel length I could get away with on a single shot rifle and maintain the same OAL as the 1894. Voila!!!! My new .358 Winchester. Made up some test loads last night and hit the range today. 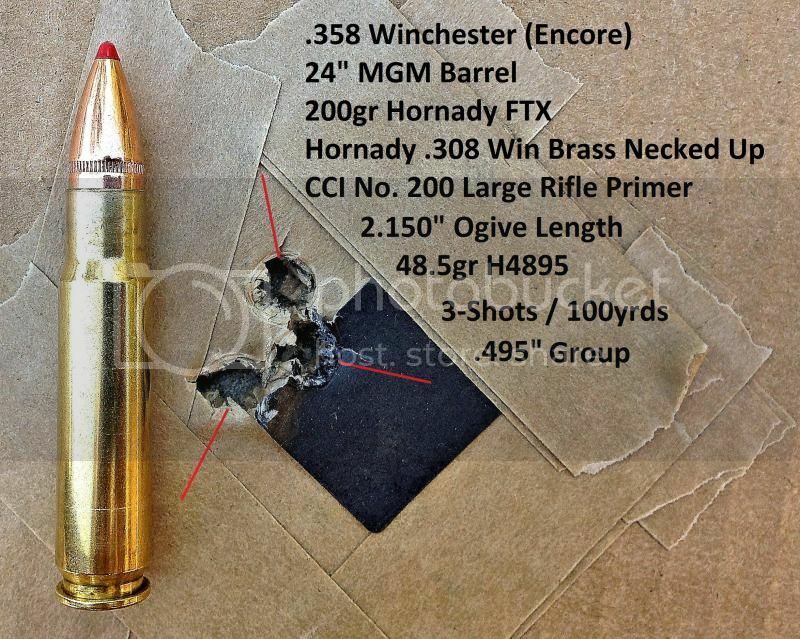 Best load so far is 38.5gr H4895 with a 200gr Hornady FTX bullet. This load moves out at 2,646 fps with a 24" barrel!!! 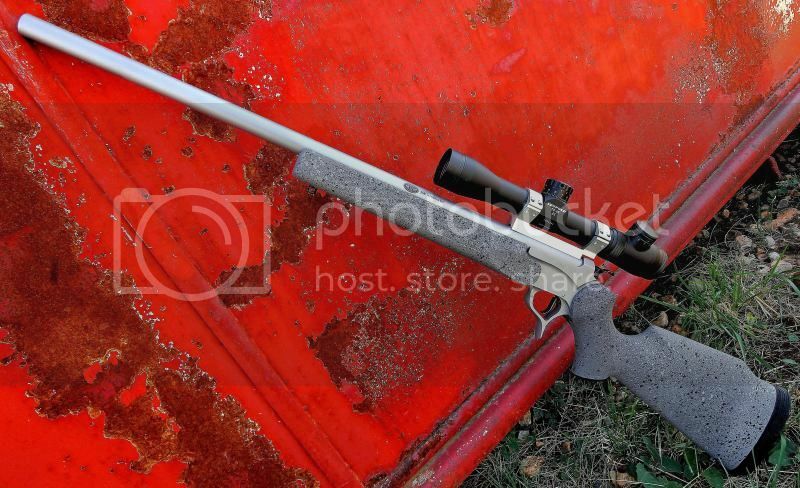 That's 127 fps faster than Hodgdon lists with a 26" barrel and 1/2 gr. less powder! I can safely say that MGM has rejuvinated my affection for the Contender and especially the Encore! I hated TC for years because of their shoddy quality control and customer service. I've now discovered a way to circumvent TC and get the quality I want through a different route. With both the action and barrels I desire. Match Grade Machine can work wonders. No wobble in the barrel/action mating as with factory barrels. A solid lock-up! Never thought it possible. Now the ugly. I replaced the factory recoil pad with a SIMMs Vibration recoil pad. Thinking the gun would be light and therefore heavier in recoil, i got rid of the factory hockey puck. Well, the SIMMs recoil pad assuredly eliminates any pain in recoil. Unfortunately, it gives TOO much. 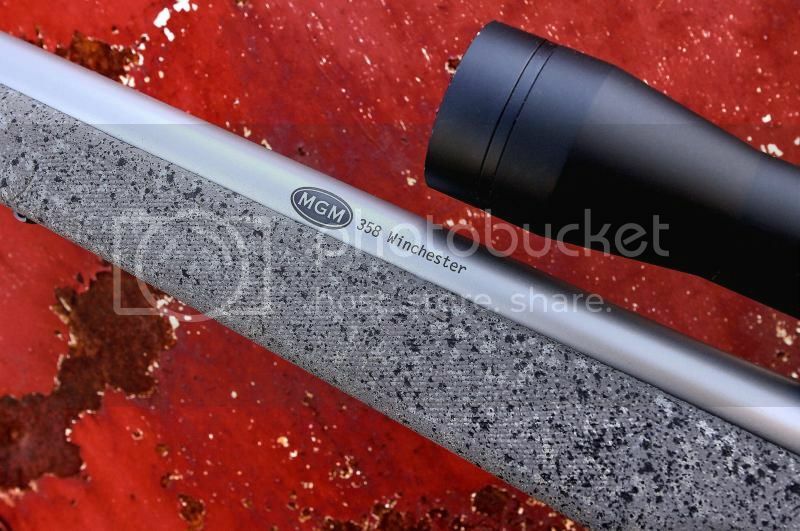 The current scope is designed for the .223 Remington and has a rather shallow eye relief. Couple the short distance to scope with a recoil pad that compresses about an inch in recoil.................you're gonna get tapped. Sucker kissed my forehead 4 times today. Even with a solid shoulder and getting into the rifle, there is just no way to prevent it with a proper sight picture on 9x. I pretty much have to roll my shoulder forward and hold at the very back of the proper eye relief. Any less, and you're gonna get punched. As I said, it kissed me 4 times today (that I remember). Never drew blood or left a welt, but I felt the top of the ocular ring touch me between the eyes on several occasions. One plan I had for this rifle was to be another loaner. That ain't happening with this scope/recoil pad combo. Sucker will knock out an unsuspecting shooter that creeps up on the scope with a soft shoulder mount. So, I'm on the hunt for another scope with a little more eye relief. Considering the Weaver 1-4x that Dan has, but it doesn't sound to have much more eye relief than my current scope. Guess we will play it by ear. It'll be Christmas anyway, before I replace the scope. Either way, I've never had an Encore shoot so well as this. Turned out to be a nice compact rifle that will get me to 350 yards and keep the bullet traveling at 1,800 fps. I like it!!! Oh, that is one STUFFED case! 48.5gr of H4895 fills the case to just above the base of the neck. Consequently, the bullet seats to the base of the neck. So, I'm not hearing the "crunch" of a compressed load.............but it's definitely sitting on the powder! Nice rig!...Serious thumper of a cartridge....Perfect Brother-in-law gun....but I thought you hated T/Cs? Correction.........I hate Thompson Center Arms. I've learned how to go around them to get what I want. Wow, that's a beautiful rifle! :drool: Shoots awesome, to boot! Way prettier than an ugly old Marlin. I can't believe somebody swindled you out of an 1894! This rifle is 38" long overall. About the same +/- as the 1894, I believe. This is the second SIMMs recoil pad I've owned. The first was on my former Tikka T3 Lite Stainless in .338 Win Mag. That rifle wore this same scope at the time and touched me a few times as well. It knocked one of my buddies punch drunk and gave him stitches. I've learned the pain reducing benefits of this recoil pad on the shoulder. And, the pain inducing effects on the forehead. A great recoil pad, but you better have substantial eye relief in your scope. This brass has worked well in every rifle I've used it in and every caliber of necking up or down...................except Jerm's .338 Federal. The bolt wouldn't extract the fired case. I'd hate to know what a Winchester lever is going for in .358 Win. I'd suspect a pretty penny. Marlin 336's in .35 Remington are going from $300 to $550. We're talking in regards to the Model 88 levergun in .358 Winchester. Different kinda beast. I would love to have a .358 in either a Model 70 or Model 88. I ain't paying the price of that Gunbroaker one. If anyone could spark in interest in my for a TC rifle it'll be you. Well, I'll never do a factory TC again. But, tuned actions and custom barrels seem to make the platform work much better. Still a little surprised to see you shooting an Encore though. It looks and shoots good though! I went back and bit into the TC game again for second go around when Erik was a pre-teen. 1. My experience with MGM on the Contender barrels and their quality. 2. 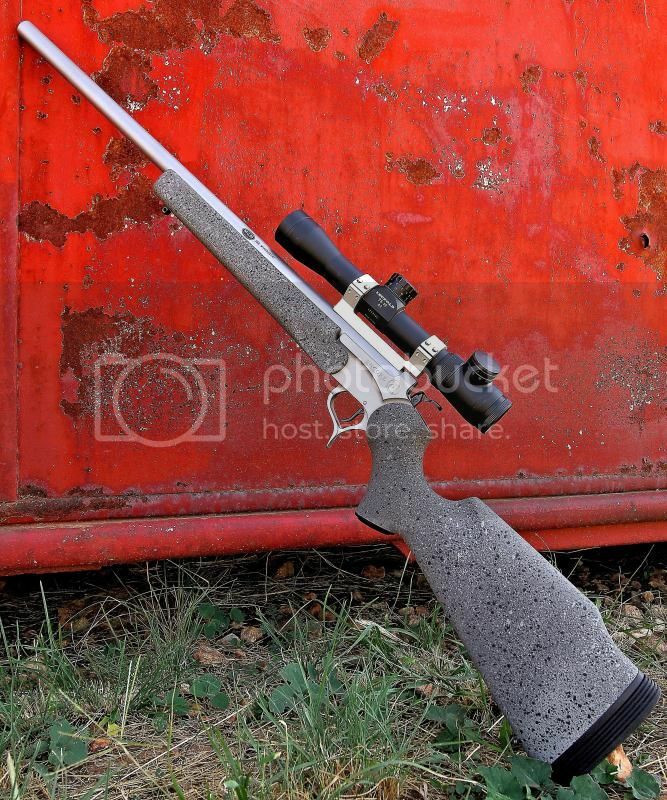 My desire for a lighter/compact rifle with ballistics of a longer barrel. 3. The fact this was not a long range cartridge and I didn't need one hole accuracy from the Encore. 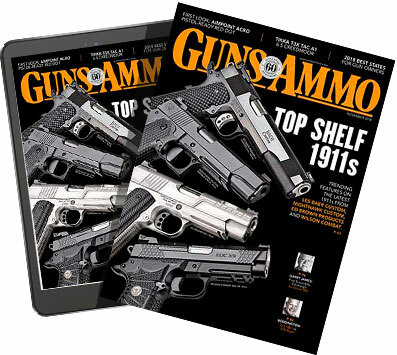 I would/will not rely on this platform for a distance cartridge or precision shooting. But, the intended purpose of this cartridge, they go hand in hand. I'm pleased so far. But, still reserve the right to keep my trust of all things TC at arms length. I have a 1955 M-70 in .358 I bought in 1960. The most accurate load I've found is with the Sierra 225 SBT and a compressed load of IMR-4895. Its always been my go to rifle where shots are limited to around 200 yds. Many times I have thought of getting a Win. M-100 and rebarreling it to .358 as it would have been a great back up rifle on Alaska fishing trips. Bidding starts at a pretty penny, and goes up steeply from there. In Thompson Center's case, functioning in the first place is a miracle. Sad that it takes custom work to cause this function.